‘A Picture is Worth a Thousand Words’. 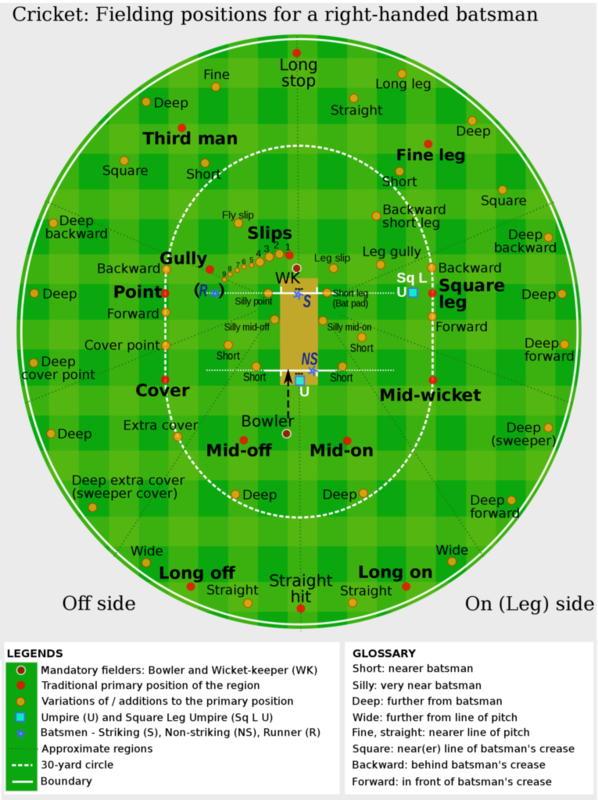 So, here is the Field position for your cricket lovers & whoever is learning cricket recently. This is mainly useful when you are listening to cricket commentary. The commentators & experts use these names a lot of times during every IPL match. You sit baffled what the hell is Fine Leg (is it fields leg?). No more confusions. Once you are familiar with these names, you would instantly know which field position the commentator is mentioning. You learned bit of field position names. Is that all about fielding? You wanna know few points about field setting restrictions in the modern day cricket? Here it goes. More than 5 fielders are not allowed on the leg side of batsmen at any point of time. Fielders cannot move their position while the bowler starts to bowl & till the batsmen plays the ball. Fielders are not allowed to stop the ball using their cap or other accessories. (5 runs will be awarded to batting team if done so). Here the field setting restrictions is explained for One Day & T20. It is basically about the number of fields allowed outside the 30 yard circle (white dotted circle in the above image). Other Overs: 7 – 20 -> Max 5 Fielders Outside.